Santorini! Yes! Finally a decent amount of time in one location to enjoy the finest of what Greece has to offer. We almost didn’t make it, because my internet search for boats from Crete did not indicate that tickets were supposed to be booked two days in advance. Our bus left obnoxiously early, and the locals once again were no help in directing us to the correct locations. We literally had to sprint to the travel agency and back to the boat. We were the last passengers on board. The six hour boat ride was fancy, and featured live music. We were told that the view coming into the port was beautiful. That is probably true, but the only deck was on the rear of the ship, and there we mobs of people trying to take pictures off the side. We (easily) made the decision to rent a car and not bother with public transportation. It was about 50 euro for days, which was well worth it. The port is full of options, but don’t eat there unless you have to. There are plenty of local restaurants with better food and better prices. The entire island is about 45km long, making it easy to see the whole thing in a limited amount of time. The roads are limited, so be sure to pay close attention to maps. We took several detours that were not intended. 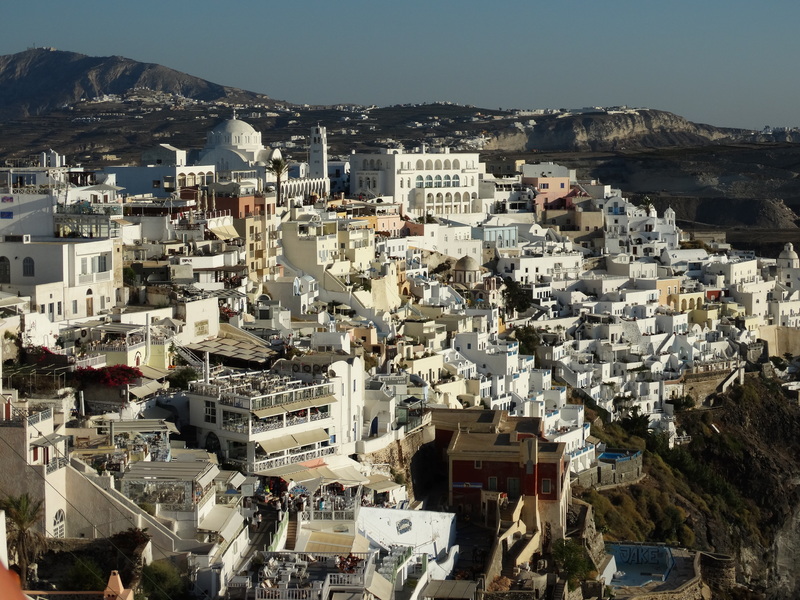 Fira and Oia are the two most popular destinations. Fira being the capital, and Oia being on the tip of the island, known for it’s amazing sunsets. 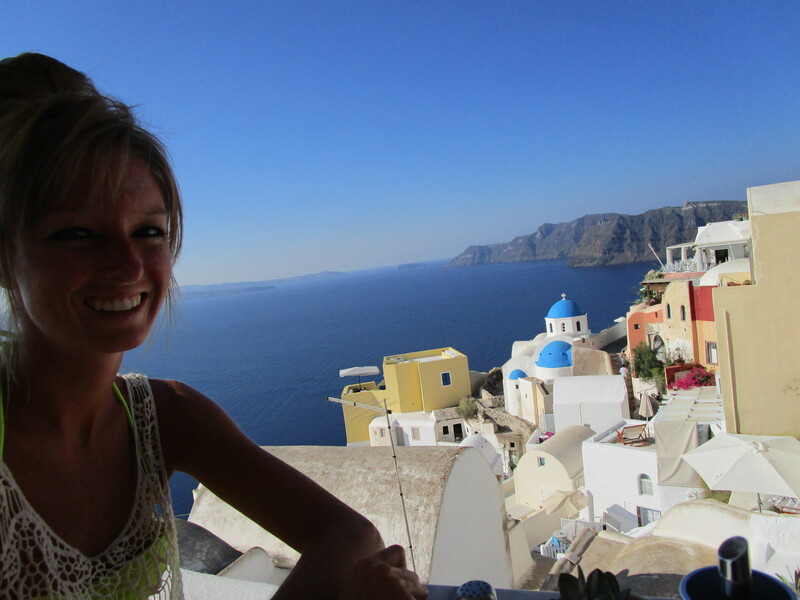 Our host was located in a small village near Oia, called Finikia. It was a traditional Greek home, built into the side of a hill. The town is small, and only has a brick walkway connecting the houses. 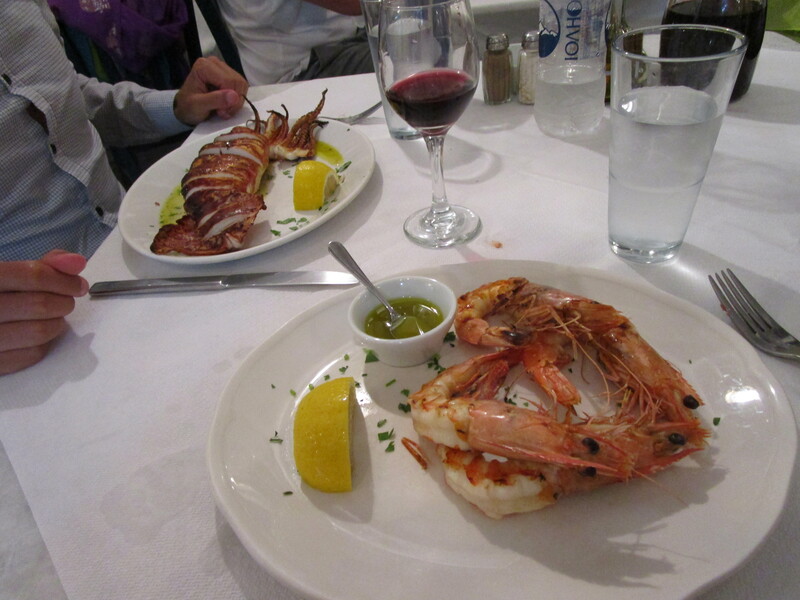 It was exactly what I hoped staying in Greece would be like. Our host was an interesting fellow. He was Swedish, and was also hosting a couple of German travelers, who preferred to stay in and read, rather than exploring the island. Our first day on the island consisted of a beach, a winery, a gorgeous sunset, and fantastic dinner. We ventured to a smaller beach, to avoid the masses of tourists. The water was not nearly as calm as we were used to, leaving the water a bit cloudy. It was nice to be able to relax alone, so we had no complaints there. Between the beach and our room was a small winery. 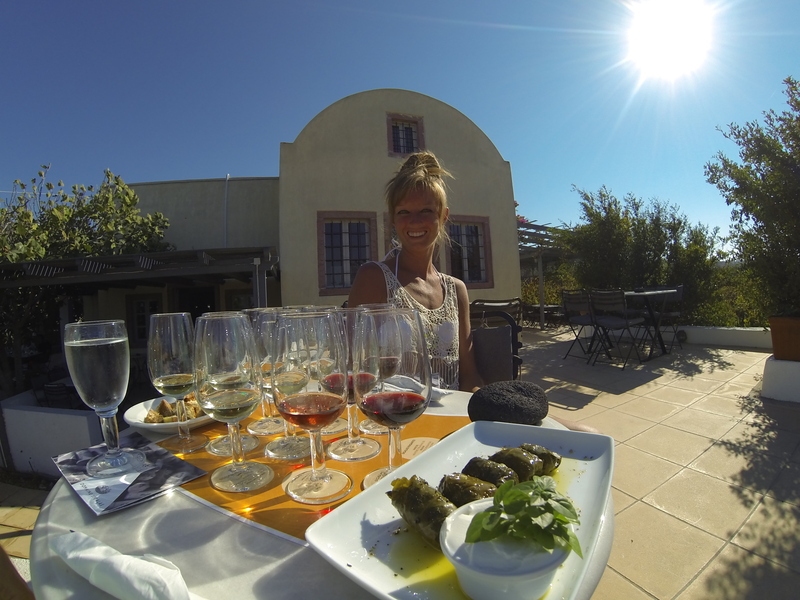 We stopped and indulged in a tasting with some stuffed vine leaves. It was delectable. After rinsing off back at the house, we ventured down to Ammoudi to watch the sunset. We we warned that Oia is practically intolerable at sunset with the amount of people trying to watch. We picked a spot off the path and on the side of hill. We were joined by a stray dog for a couple hours who enjoyed eating rocks. We named him Toby. Odd dog, if you ask me. The sunset was beautiful. It sets directly into the ocean, like a giant orange ball falling into the depths. 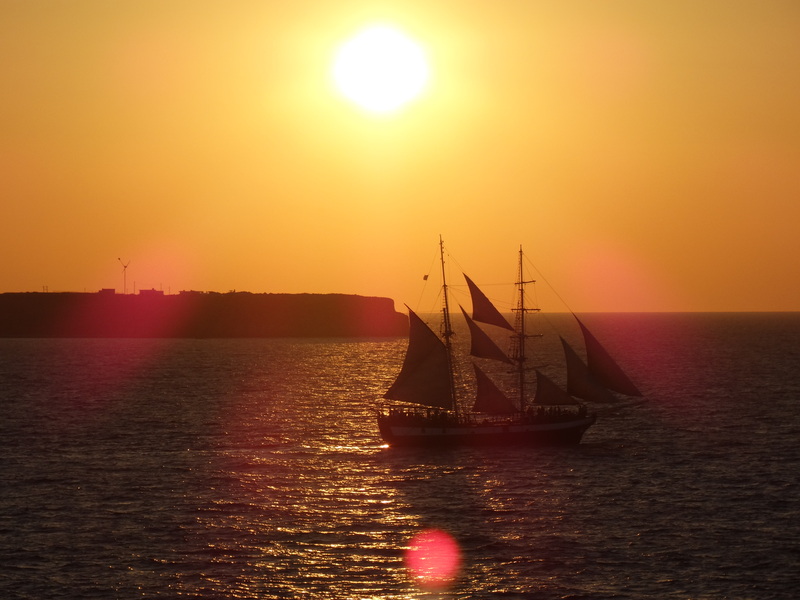 As the sun begins lowering, cruise ships and sail boats fill the bay to enjoy the view. Immediately following the sunset, we changed clothes and found a seat at a bay side restaurant where we enjoyed some… interesting sea food. Kim had shrimp, eyes and all. I went with a portion of calamari. The squid was rubbery, but tasted fine. Kim had some difficulty dismembering her shrimp, but they were also delicious. Of course we washed it all down with a nice bottle of red wine. Day one in Santorini was a success. We woke up early the next day to walk through Oia without the crowds. These Greek towns are known for their white buildings and blue-domed churches, and it looks every bit as cool in real life. The restaurants are not crowded in the morning, so a good seat for breakfast is a given. We then wandered around looking for some hand crafted souvenirs. There are plenty of typical souvenir shops, but finding a quality handmade shop proved difficult. 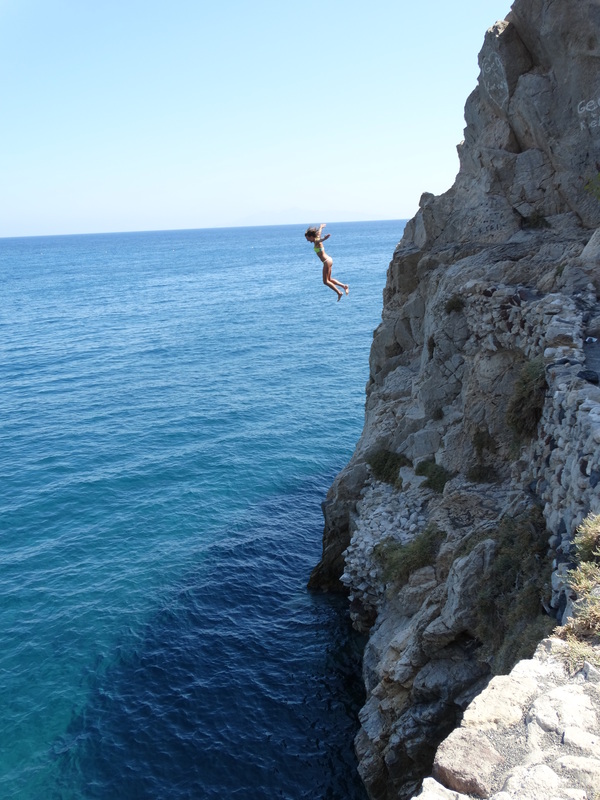 After Kim found her keepsake, we headed to Kamari beach to relax and do some cliff jumping. The cliff is no more than 30 feet high, but some locals were taking a running leap from nearly double that. The beach was crowded and the Americans were the most obnoxious people around. Nonetheless, it was worth the stop. We then left to try and find Red Beach, which is when we ended up driving around the whole island unintentionally. After a mediocre lunch, we found our way to the parking lot for the beach. We weren’t sure if we had made it, because our expectations had been lowered by the amount of time it took us to find it. Thankfully, the beach is beyond the parking lot, just a short walk up and around. The beach is quite obviously named Red Beach because it’s a dark red color from volcanic ash. The main strip of the beach was crowded, but there is a small section to the left as you walk down that offers a bit more privacy. Kim and I spent awhile just exploring the water and she found a giant sea slug, and a couple red things. Not sure what they were, though. That was sadly our last trip to the beach, but it was a good one. 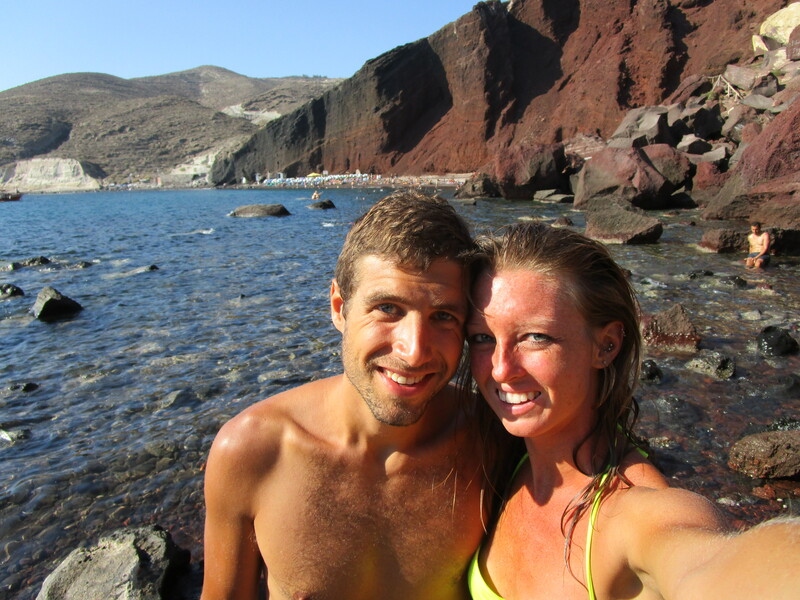 We hopped back in the car and proceeded to get lost again on our way to Fira. We eventually made it and walked around before grabbing some ice cream. Ice cream so good that we literally walked back and each bought a second cone immediately after finishing the first one. 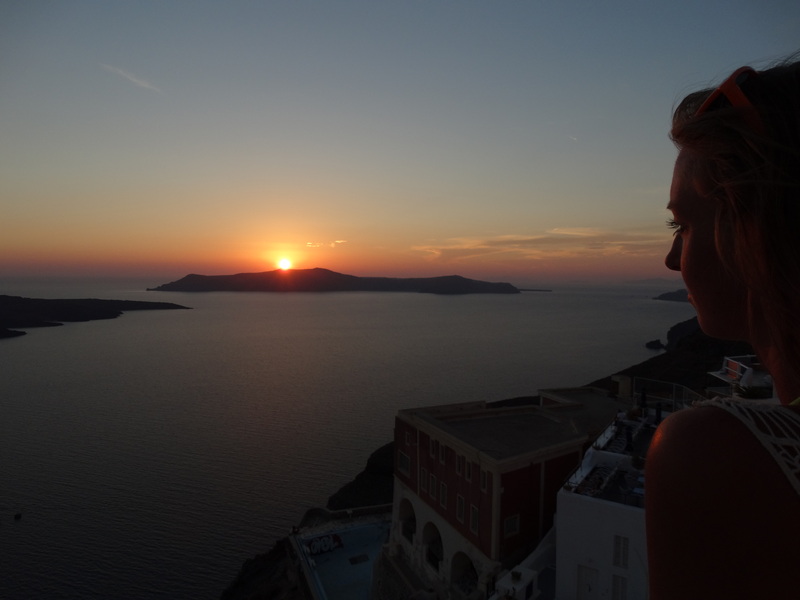 We stayed in Fira to watch the sunset and enjoyed a late dinner with some wine. As we made our way back to our accommodations, the stars lit up the sky. It was the perfect end to a perfect trip. We left around noon the following day and began our extensive trip home through Athens, Rome, Bacelona, Charlotte, and Indianapolis before finally driving back to Fort Wayne. This was an extremely special trip for me; one I won’t soon forget. On to planning for the next one!